LONDON: Suspended Test batsman Nasir Jamshed has threatened to take the Pakistan Cricket Board to court, alleging that the PCB has been trying to implicate him in a spot-fixing scandal by coercing fellow players to testify against him. 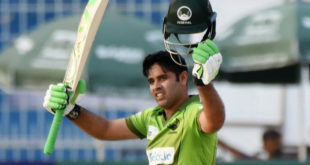 Jamshed – a left-handed opener who played two Tests, 48 ODIs and 18 T20 matches -, said since he was in the United Kingdom, the PCB was trying to force players to speak out against him. Jamshed, who is one of the six players suspended by the PCB in the Pakistan Super League spot-fixing scandal, said he is consulting legal experts. “If they really have any evidence against me, I challenge them to present it to the media. Such allegations are affecting my personal life,” Jamshed said. PCB’s legal advisor Tafazzul Rizvi told the media recently that suspended Pakistani player Muhammad Nawaz was contacted by Jamshed in Australia. “My lawyers are looking into the details and we will take PCB to the court to prove their allegations against me,” Jamshed said. The Board has already banned left-arm Test pacer Mohammad Irfan for 12 months in the case while batsmen Khalid Latif, Sharjeel Khan, Shahzaib Hasan and Jamshed also remain suspended. Sharjeel and Khalid have denied any wrong doing. Their lawyers have also repeatedly claimed that the head of the PCB’s anti-corruption unit, Colonel (retd) Muhammad Azam Khan, had tried to pressurise the players and force them to give confessional statements.